A Site Who’s ALL IN On Drums! Some might be confused about our site name DrumPerium but I’ll come to the naming of this site later. First, I’d like to give you a short (but sweet) summary of My Relationship With Drums throughout my life, and the reason for starting this site. I’ve always been a huge fan of hitting things that produce a sound, the louder the better. Before I could even walk, I used to crawl the kitchenfloor and collect all things within reach like saucecans, buckets etc. Then I’d put all these things around me (I presume with a drum set in mind) and started slamming ’em. Preferably with spoons or forks as ”drumsticks” but bread knives would also do just fine. Poor parents who had to put up with all these noises. If not mistaken, I think my parents gave me a Toy Drum Set for Kids as a christmas present two years in a row. As each christmas eve ended up with either a cracked ”cymbal”, damaged drum(s) or both… I guess I’ve always been a hard-hitting drummer =P. Looking back, It seems like my passion for Drums started prior to full brain-development. I mean who else would have been literally druling over a (ugly) drum set photo in a book from the library at the age of 5? Yeehaa! Drum Lessons And Finally, A Real Drum! A year later, I asked my parents for drum lessons. my parents consented. However, the lessons lasted only less than a month or so as I quickly bored of the lessons not progressing fast enough. At least I got something good out of it. These lessons required bringing your own snare drum (or a practice pad). So before the 1st lesson I purchased My First Real Drum. It was a Snare Drum by the brand of ”Maximus”, ”Maximilian” or something like that. First Real Drum Set I bought was a classic, used, gold-colored TAMA Swingstar. A standard 5-piece drum kit which I used frequently, either practicing myself or playing with friends (those who owned a guitar). Since then I’ve owned a Black YAMAHA Power V Special Drum Set, a Purple TAMA Artstar ES (w. Double Bass Drums + Additional 8” Tom), Pintech Tour Elite (w. Roland TD-8) and my latest and only one in posession now; a Roland TD30-K Special Edition Drum Set (seen below). Mine’s equipped with a Double Bass Drum Pedal and some other niffy stuff. The Reason for switching from Aucoustic to Electronis Drums after the TAMA Artstar ES wasn’t really a choice but a decision I had to make, If I wanted to continue Playing Drums that is. Since the age of 19, due to all drumming, I suffer from Hyperacusis* (Extreme Sensitivity to Sounds) which isn’t exactly on top of a drummers accomplishments list. But, I am glad there is an opportunity for Drummers like me to still be able to enjoy the greatest thing in the world: To Play Drums, Electronic Drums. A Huge thanks goes out to all companies making this possible. 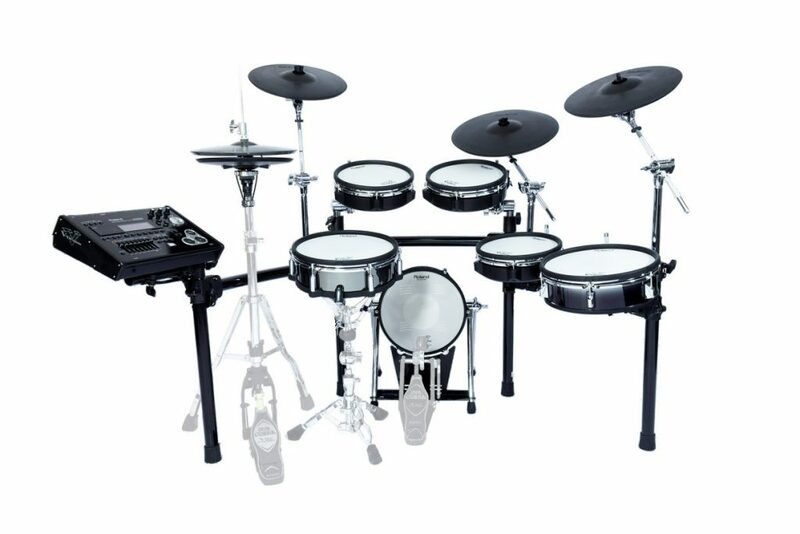 Companies like PinTech, Roland, Alesis Who continuously improving the Electronic Drum Sets. And for allowing ”Damaged” Drummers, like me, to play drums using Headphones at any volume your comfortable with! Also, I must admit (if we aren’t there already) we’re pretty DAMN CLOSE acheiving the Feel AND Sound of Aucoustic Drums on some Electronic Drum Sets today. I bet there would be a lot of Jaw Dropping If people found out how few of their fave drummers actually using 100% Acoustic Drums Sounds in Studios today. That includes NOT using a single trigger or other Electronic Drum accessory connected when recording or mixing the Drums. Any Good Site Focusing On Both Electronic And Acoustic Drums? This Excludes All Online Stores Using A Sale Pitch! The Reason For Starting DrumPerium was the Plain Simple Fact that There’s A Huge Lack of Real GOOD Drum Sites. Especially sites who’s not entirely focused on Acoustic, But give Electronic Drums just as much attention. A Site Providing Latest Info On Hot Upcoming Drum Kits and Hardware Releases AND, Last but not least, Electronic Drum Sets, Drum Pads News and Reviews. Thats Why DrumPerium Was Started As My Vision Is To Fill The Gap Of All Of The Above. Furthermore, We’ll Cover a Wide Variety Of Other “Stuff”, For instance, Drummers(!?). We’ll always Keep eye on What the Best Drummers are up to and also provide you with nifty Drum Tips and Lessons. Finally, I Must Admit That… Drums is Facinating, Drums is Exciting, Drums is Fun, Drums is Challenging… And… IF There’s A Drum Emperium Somewhere, Anywhere… Count Me In! (On One Condition): We’d Name It DrumPerium! * If You Don’t Want To End Up Like Me, I’ll Give You One Out Of Numerous Examples, To Be Forced Eating Dinner Using Special Super-Soft Plastic Plates (Not The 1 Cents, But Very Expensive And Hard To Get!) For The Rest Of Your Lives.. Protect Your Ears Before It’s Too Late!